First off, when was this film really made and released? 2011? 2010? 2009? I am not quite certain, but the setting is 2008. Weinstein took forever to put this film into any theatres outside LA and New York. It was just last week before it expanded into more than 200 theatres nationwide. We are calling it a 2011 film. What were they hiding and what were they afraid of? If you follow TMG and Joy Lynn, you know we hate limited release movies where the established print movie critics see these films about a year before you do. By the time these films come to your local theatre, you are certain you have already seen them because you have sat through 267 previews, trailers and Entertainment Weekly stories on them already. 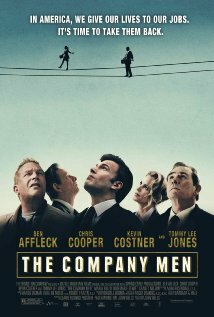 The official website for this film states, and I quote “At its heart, The Company Men is not “the recession movie”…” We agree. It isn’t. It is the depression movie. And I am not talking macro economics here. I mean real mental depression. Writer John Wells, (The West Wing after Aaron Sorkin left) forgot basic movie concepts like comic relief and uplifting message. I walked out of the theatre just feeling like crap. I go to movies to escape reality, to laugh or to learn something. This film is just a dose of way too much reality I see every single day. Bobby Walker (Ben Affleck) is a hot shot, upper level exec at GTX Corporation. GTX is a diversified transportation conglomerate that represents the worst (or perhaps in reality, the best) in corporate America. High paid incompetent bean counters (portrayed realistically by CEO Crag T. Nelson) at the top of the ladder flying in jets, playing golf and enjoying $500 lunches while the real workers that actually produce something, pay taxes and get by. Corporate downsizing comes along and tosses Bobby and his co-workers Phil Woodward (Chris Cooper) and Gene McClary (Tommy Lee Jones) back on the streets. Bobby and Phil were just living the dream on cash flow. Gene left with millions in stock options, but at least he has a conscience about the lives left behind. They each face reality in their own way. Each of these men had lost his real roots and inner self, overwhelmed in consumerism, stock options and status. Bobby finds redemption after spending time really working for a living with his wife’s brother Jack (Kevin Costner). Affleck and Costner give outstanding personal performances. Gene decides to build a new company and Bobby wisely agrees to start all over again at the bottom. Phil, too old to start over and one rung short of massive stock options, chooses an all too familiar way out. I guess there are some winners here, but the overall film was a massive downer despite being incredibly well acted by the best of our time. The fact is you can walk down the street to irresponsible companies like AT&T, General Motors, General Electric, Comcast Corporation, Capitol One, Bank of America and on and on and see the same thing every day. This film was unfortunately more of a documentary.